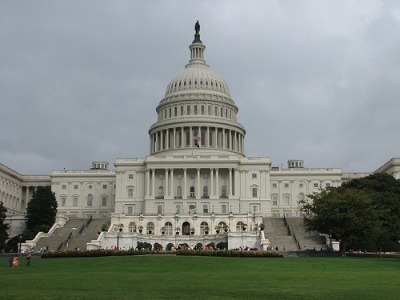 House Republican leaders and Senate Democratic leaders finally agreed Thursday night on the conference report for the omnibus appropriations bill to fund the federal government for the rest of the 2012 fiscal year. The Congress is expected to send the bill to President Obama for his signature before midnight Friday, thereby averting a government shutdown. There were a number of riders in the Interior and EPA appropriations bill passed by the House. Nearly all of the EPA riders were taken out by the House-Senate conference committee. The omnibus bill does cut EPA funding by $240 million below the FY 2011 level. One Department of Energy rider that did survive will block implementation of the ban enacted in 2007 on standard incandescent light bulbs. That ban was scheduled to begin taking effect on January 1, 2012, when it would have become illegal to sell 100 watt bulbs. The rider only delays the ban from taking effect until the fiscal year ends on October 1, 2012. However, once adopted, most riders are routinely extended in succeeding appropriations bills. To take the rider out in future years, supporters of taking away consumer choice on light bulbs will have to mount a major effort. As of mid-day Friday, the House and Senate are still wrangling over the bill to extend the payroll tax cut for another year. A major stumbling block are two energy-related provisions included in the bill, H. R. 3630, that the House passed earlier this week by a 234 to 193 vote. The first would require the president to make a decision within sixty days on the proposed Keystone XL Pipeline project. The second would block the EPA’s Boiler MACT rule from going into effect. President Obama and the White House have stated several times that including these two provisions in the payroll tax cut extension bill is unacceptable, but it’s not clear whether a veto threat has been made. Senate Majority Leader Harry Reid (D-Nev.) has refused to allow the Senate to consider the House-passed bill because of the Keystone and Boiler MACT provisions. House Speaker John Boehner (R-Ohio) said on Friday that the Keystone language was going to be in any payroll tax cut extension bill passed by the House. Boehner did not make an exception for a two-month extension. Thus if the Senate sends any bill minus Keystone back to the House this weekend, then the House Republican leadership seems determined to call the House back into session next week and re-attach the Keystone provision and send the bill back to the Senate. The House would then recess for the rest of the year. Boehner’s strategy seems to me to put President Obama and Senate Democrats in a very difficult political position. If the Senate doesn’t accept the Keystone provision or if President Obama vetoes it, then Social Security taxes will return to their usual level in the new year. The president and Senate Democrats will then have to defend raising taxes on the grounds that that was the only way to stop the $7 billion Keystone project that will create thousands of construction and manufacturing jobs and increase supplies of Canadian oil. Would seem as though Mr. Boehner’s strategy back-fired — again — given that it’s now he and the recalcitrant House Republicans that either have to put up or shut up or provide us all with a hefty tax increase come 01.01.12! The Congress is worthless in general, and the House is led by the only guy you can’t trust to make and stick with a deal.